The Mariners honored the new single-season hit record holder with 17 singles tonight. They had just one extra-base hit -- a Raul Ibanez double -- and one walk from Randy Winn. It's very fitting. The military uses a 21-gun salute. The M's use a 17 single salute. Oh, and I am not ashamed to admit that I gave no fewer than seven standing ovations from my dorm room. With all due respect to Chris Bosio and Randy Johnson, this was the coolest achievement by any player in Mariners history. A record that had stood for 84 years, not once seriously challenged after Bill Terry's 1930 campaign, is no more. A seemingly invulnerable record, demanding unthinkable consistency of any player who hoped to attain the lofty sum. The type of player best suited to make a run at the mark was being phased out of the game in favor of more patient and powerful hitters. And then Ichiro came along. As a speedster with otherworldly bat control and an aggressive approach at the plate, Ichiro had the best chance of anyone to break Sisler's record. He had already made a run once before, smacking 242 hits in his rookie season, eclipsing Darin Erstad's total and setting a modern-day baseball record. And that looked like the best anyone could do, with today's players content to limit their hit opportunities by drawing more walks and trying to hit for more power. But what do you get when you give 695 at bats (tied for seventh all time, ten behind Willie Wilson, the leader) to a quickfooted singles hitter? In this case, you get baseball history. I don't want to provide any more commentary on the achievement - you'll be able to find that kind of thing anywhere. Rather, I thought I'd provide you with links to video clips of his record-breaking third inning at bat, complete with all six pitches, Niehaus' wonderful call, and the ensuing on-field celebration. Jeff's note: the first video clip, along with the press conference link further down, may be inactive (the FTP may be shut down in the morning). However, Link #2 to Ichiro's at bat should still work. ...and that's not all. After the game, there was a press conference held for Ichiro to discuss his achievement. I've got a link to *that* one, too. Had I taken the time to look at today's pitching matchup, I probably would've (rightly) predicted that Ichiro would break the record tonight. Anyone who's been around in the last week - or who has been linked here by the Prospectus Roundtable discussion - knows that Ichiro's hit rate is directly related to the percentage of groundballs he hits. Well, Ryan Drese entered the game with the fifth-highest GB/FB ratio in the Majors, at 2.27. Indeed, everything was in place for history to be made. Unfortunately, the Mariners broadcast team got a little overstimulated, and started talking about how Ichiro "could very easily break his own record next year". Their explanation was that Ichiro had such a poor April, and that by hitting closer to his average numbers in that month, he could have broken this record weeks ago. Of course, that completely ignores the probability that Ichiro's 2004 performance is unsustainable over an extended period of time. However, this thought was still in the process of being formed by my brain when Niehaus began to flirt with the idea of Ichiro hitting .400 in 2005. At that point, I gave up trying. Clearly, Dave and I share no telekinetic connection. Niehaus: "Ichiro scores, and that will tie the game at 1! -wait, no, it's 2-1 Texas..."
Niehaus: "After six straight hits, Showalter's trying to find out a way to stop the bleeding." Me: "Summoning John Wasdin is never a good way to stop the bleeding." Sure enough, Wasdin allowed two more hits to score, and nearly allowed a third when a deep line drive to straightaway center off the bat of Ichiro was snared by a leaping Laynce Nix. This shall likely forever remain the only play in baseball history that causes me to elicit an audible "Holy Moses Malone!" The catch was strikingly similar to the one Reed made a few games back. Later in the game during a Jeremy Reed at bat, Rick Rizzs was talking about how impressed Ibanez was by the kid during a rehab stint in Tacoma. Raul, it seems, knew that Reed was a hitter by "the way he shuffled his feet in the batter's box." This creates two possibilities: One, that Ibanez doesn't have any idea what he's talking about, or Two, that the Mariners are paying the wrong guys to scout. Of course, I wasn't able to consider the choices much longer, as Rizzs and Hendu began to question whether or not "hitterish" is a word. Does anyone else get irritated when the camera is late to return to the action after a commercial break? This happened on no less than four separate occasions tonight (and probably more; I wasn't paying close attention), once completely missing a Randy Winn leadoff single. Can you imagine what would have happened if they missed an Ichiro hit? Well, they conveniently made a point of returning to the game far too *early* when Ichiro was due to lead off. This suggests that the producers are aware of the problem, and quite clueless as to how to fix it. In the ninth inning, Bret Boone made a diving stop to keep a groundball from reaching the outfield. Hendu couldn't help himself from gushing. "You usually don't see this kind of hustle from a team so far out of it," he said, apparently having completely forgotten about Boone's recent skid of poor defensive plays that many attribute to a lackadaisical attitude. Both Greg Dobbs and Jose Lopez made throwing errors in tonight's game. This has been something of a recurring problem with the latter (Dobbs hasn't played enough to establish habits or patterns), and recalling Justin Leone's early problems with getting the ball to first base, you have to wonder what the problem is with our rookie infielders. After all, Lopez has been up here long enough to shake off the nerves. 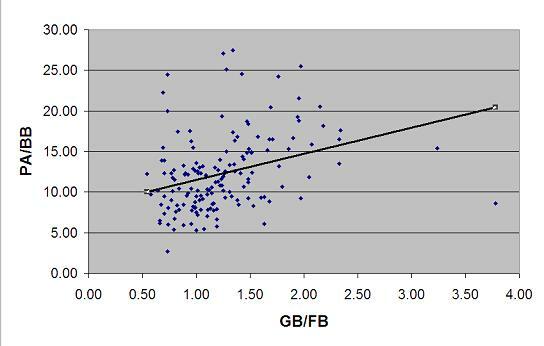 One possibility is that players begin to focus more on making an offensive impact when they reach the Majors for the first time, at the expense of their footwork. Another good quote from tonight: a friend walked in while I was watching the game and, noticing all the smoke in the air following Ichiro's 258th hit, remarked, "Dude, St. Helens must've gone off worse than I thought." Finally, if anyone knows where I'll be able to pick up a copy or three of the Edgar DVD's they're handing out tomorrow, that would be much appreciated. Neihaus: "Teixeira's done most of his damage from the left side of the plate..."
Jeff: "No he hasn't, he's hitting 24 points better as a righty-"
Neihaus: "...he's hit 28 of his home runs as a lefty, and just nine from this side." The Mariners' 2005 home schedule is out (.pdf file). A couple of years ago in the pages of Baseball Prospectus 2001, we praised Bryan Price as something near a savior to the young arms of Seattle. Mt. Piniella was in full effect in the days before the pitch-count police and Price's reining in of Piniella seemed worthy of praise. Perhaps Price has never had the control of the organization's pitching prospects in the way that Rick Peterson or Bob Cluck has. Perhaps Pat Gillick or Benny Looper deserve some blame as well. I can run through the list of names--Ryan Anderson, Gil Meche, Matt Thornton, Rafael Soriano and, now, Cha Seung Baek--who have been chewed up in the Mariners system. Instead of developing pitchers, they seem more inclined to send their arms through a woodchipper. I can't pinpoint the cause from my perch outside the system, but it's apparent that no one inside has much more of a clue. Secondly, and free for anyone to read, is an Ichiro roundtable, in which a bunch of BP authors got together to discuss his magical season. Fans of Tony Gwynn should advance at their own risk. 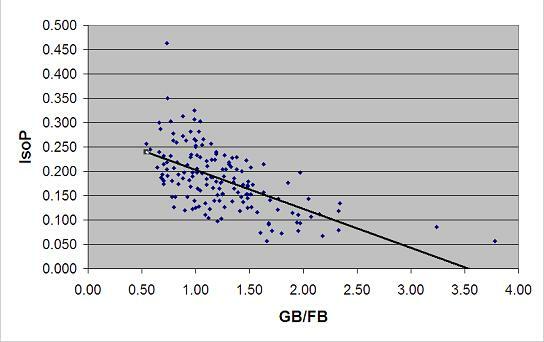 Jason Grady: That he gets more hits that go through to the outfield and that his infield hit rate are down are most likely not the result of placing the ball better or losing a step, respectfully, or luck in general but because the infielders don't play at normal depth. Their angles are worse so more balls get through, but the ones that don't aren't becoming hits because fielders are in. It's an interesting theory, to be sure - that infielders are playing Ichiro shallower to cut down on his infield hits, and thus allowing more balls through to the outfield - but what it doesn't explain is why Ichiro's numbers were in decline the previous two seasons. It doesn't take three full years for infield defenses to adjust to a certain hitter, and there was certainly no reason for teams to suddenly change their defensive strategy at the beginning of the season, as Ichiro was coming off the worst campaign of his brief career. Melvin: "We've all been in the big leagues long enough to know that losing 100 games stinks." Dobbs: "Speak for yourself, coach." Reed: "Yeah, what are you talking about?" Bloomquist: "Simmer down, guys, the skipper's talking to you." Melvin: "Any veteran in the clubhouse can tell you just how tough it is, I mean psychologically, to lose 100 games. It can break your spirit." Boone: "Hey, I can put a spoon on my nose!" Melvin: "It reflects poorly on you guys, it reflects poorly on me." Boone: "Wait, no I can't." Melvin: "I can't speak towards my future with this organization, but a lot of you guys are near the end of your careers, and nobody wants to retire after losing 100 games." Reed: "Do you even know my name?" Boone: "Why won't it stick?" Melvin: "I mean, do you think Edgar wants to leave on a sour note? All he wanted was one last shot at a ring, but things haven't exactly worked out like we thought they would." Ibanez: "You have to lick it first." Melvin: "You've got to do it for yourselves. Everyone in this clubhouse has a lot of pride in their big league careers, both present and past." Boone: "It's still not sticking." Melvin: "We know what we can do at this level. We haven't done it most of the season, but if we play at the level I know we can for the rest of the year, then we can end on a good note and avoid those 100 losses." Ibanez: "No, no, that's too much. Just a little moisture." The meeting seemed to inspire the club, as they slapped together three wins in a row against playoff contenders, but the possibility still remains that the team's loss total could reach the triple digits. The odds are slimmer now that Texas has been eliminated from contention, but they're still the superior team, and I'm not ready to rely on one of Villone, Moyer, or Meche to steal a win (although I'd give a leg to see Moyer toss a gem on Edgar Day). The talk of the day, of course, was Ichiro. In going 1-for-5, he extended his hitting streak to ten games (his fifth streak of at least ten games on the season) and moved within a single hit of Sisler's record. With three games left in the year, Ichiro needs one hit to get his name in the record books, and two hits to get his name all by itself. A quick scan of his game log reveals the fact that he hasn't gone three games without a hit all season long, which is why fans and media outlets around the nation are considering it a foregone conclusion that Ichiro sets the record. In fact, Ichiro hasn't gone three consecutive games without a hit since September 6th-8th, 2002. You can see why everbody's getting excited. As an added bonus, with Texas having fallen out of the race, they will have no reason to intentionally walk Ichiro to avoid a run-scoring hit. Let's pretend like Ichiro gets 13 at bats in this series, his approximate three-game average in September. The odds of him going hitless are 0.24%, or roughly once per 415 opportunities. It is looking real, real likely that Ichiro reaches 258. Franklin ended the season with a 4-16 record and a 4.90 ERA. He held opponents to two or fewer runs in 11 of his 32 starts. If you just think about it for a second, that doesn't sound so bad - you get Pedro Martinez (the old one, not the inconsistent 2004 hybrid) in a third of Franklin's starts. But then you start to consciously demand further information. Information such as the fact that Franklin has just 13 quality starts on the season. So, yeah, Hyde showed up pretty much as often as Jekyll did this year. When you consider that allowing four runs in 6+ innings really shouldn't be considered "average", then you see a worse picture. On to the biggest homestand of the season. Example 1 of why strikeouts don't matter much for hitters. In case you missed it, recently promoted Indians pitcher Kyle Denney was shot while riding the team bus. Someone fired at the bus as it was between freeways, and the bullet nicked Ryan Ludwick before settling into Denney's calf. Neither is seriously injured. As part of a rookie hazing ritual, Denney was wearing a Southern California cheerleader's uniform when he was shot. The outfit included high white boots. "Our trainers said the boots may have saved Kyle from further injury," Swain said. At least we've uncovered a positive side of hazing. Update: some other sources say he threw 133, which is still ridiculous. I admit, I'm fascinated by all this groundball/flyball stuff. It's the kind of thing that slips under the radar, because you don't really notice a player's tendencies. It's obvious if a guy has a lot of power or has trouble making contact with the ball, because he'll hit a bunch of home runs, or strike out all the time. Everyone can provide an example of each type of player. However, what if I told you to name a flyball-prone hitter? You'd probably name Barry Bonds, or maybe the player on your team who always seems to pop-up in critical situations. You probably never would have guessed that Jose Valentin has the lowest GB/FB ratio of everyday players in the Majors (Valentin has to lead some statistical category, now that Adam Dunn is doing his best to strike out 200 times in a year). Indeed, there appears to be a correlation between hit and groundball rates throughout the league. We may infer, then, that it is "easier" to get a hit on a groundball than a flyball - presumably because outfielders have more time to react to flyballs in play than infielders do grounders. If you're curious, Ichiro and Luis Castillo account for the points furthest to the right, and Barry Bonds is the anomaly to the left. One of the assumptions I made in my analysis of Ichiro a few days ago was that a small percentage of his damage has come on flyballs, because flyballs that drop in would be reflected by a higher extra-base rate. Was this assumption correct - do flyball hitters collect more doubles, triples, and homers than their groundball counterparts, thus making up for their lower collective batting average? Pretty clear correlation here. IsoP is a measure of power, easily calculated as Slugging Percentage - Batting Average. The groundball hitter with the highest IsoP (Shawn Green, .197) has pedestrian power when compared to the group of flyball hitters. 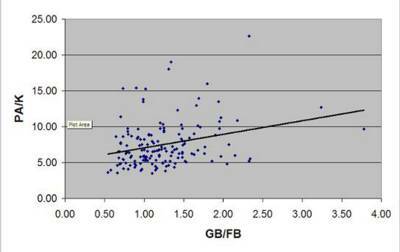 Every hitter with an isolated power rating of .250 or higher puts the ball in the air. 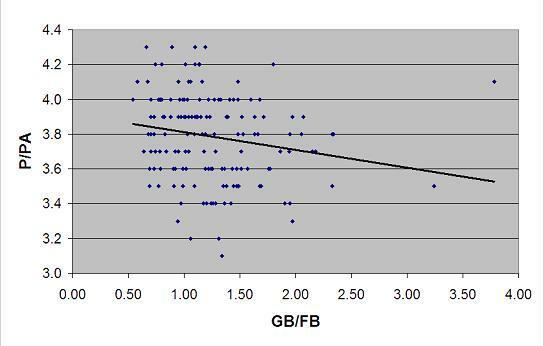 Thus we may conclude that groundball hitters collect more singles than the rest of the data pool, but flyball hitters make up for it by smacking balls off or beyond the fence. Well check it out, I wasn't delusional - hitters who put the ball on the ground are also quite averse to drawing a walk, at least when compared to flyball hitters. 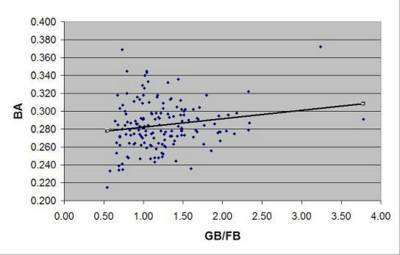 Now, a low walk rate doesn't automatically make a guy an aggressive hitter, so we have just one more graph to plot. Bingo. The more balls the average hitter puts on the ground, the less he walks, and the less he strikes out. 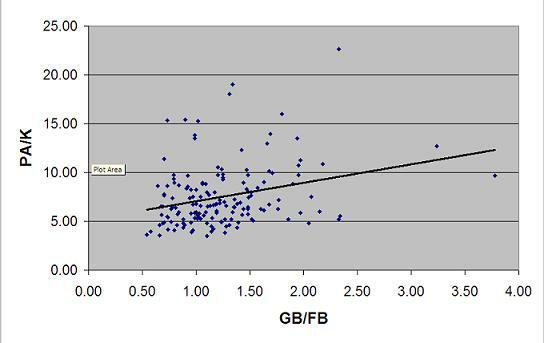 Groundball hitters, as a group, prefer to swing early in the count and are good at making contact. This really comes as no surprise, considering that Ichiro, Castillo, Juan Pierre, and other "slap hitters" populate the right-hand side of the graphs, while Mike Cameron, Adam Dunn, and Brad Wilkerson types man the left-hand side. Still, though, it's nice to establish a league-wide correlation. When the BBC takes notice, you know you're seeing something extraordinary. The Hardball Times gives a quick look at Ichiro's amazing season (scroll down). Specifically, how amazing it is that he's kept his batting average so high over nearly 700 at bats. 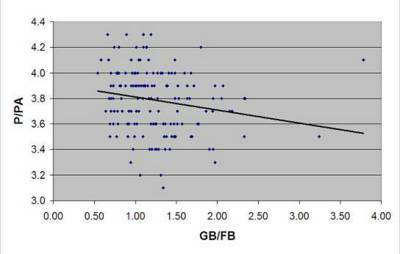 If we take a leap of faith and claim that there is a causative relationship between Ichiro's BA and GB/FB ratio, then in order for Ichiro to hit .400, he would need to hit four groundballs for every flyball (a 25% increase from his current standing). The last time somebody put up a GB/FB ratio of 4.00 or above was 2000, when Luis Castillo (perennially near the top of the leaderboard) put up a 4.74 mark. It is difficult to sustain such a high ratio over a long period of time - most players who finish a year above 3.00 typically fall into the 2's the following season. Just another example of how Ichiro's season has been so extraordinarly (although granted, monitoring groundball-to-flyball ratio isn't as thrilling as batting average, nucleophilicity, or linoleum). In case you are ever taking in a game at Chavez Ravine, do not litter as Milton Bradley takes serious offense to anyone throwing any refuse onto the field. Serious offense. A few days ago, Larry Stone addressed the "purists" who would place an asterisk by Ichiro's record, should he go on to smack #258. The reason? George Sisler's 257 mark was set in a 154-game season (but you knew that already). Thus, it isn't difficult to extrapolate that this is a problem of opportunity; Sisler's 257 hits came in 631 at bats, whereas Ichiro will reach 700 before the end of the season (he's currently at 252 hits in 677 ABs). Indeed, anyone can see the issue here. Ichiro may end up with 260 hits, but who's to says that Sisler wouldn't have recorded four more, were he to play a 162-game season? It's a problem with any given counting stat, and the main reason why I prefer rate metrics to the alternatives; a player's home run total, his doubles, his VORP...it's all dependent on how much he plays. A better way to look at the numbers is to divide by the opportunities in order to establish a common denominator. Jose Vidro's 2004 VORP is 28.5, whereas Tony Womack's is 30.8; however, Vidro only played in 110 games for a VORP/game ratio of 0.26, while Womack's sitting at 0.22. Over a full season, that equates to a difference of about six runs - Vidro has been the better player this year, when he's been able to take the field. So, can we do this with Ichiro and Sisler? Well, yeah, that's what batting average is for. However, at .372 and .407, respectively, Ichiro doesn't come out looking any better - in fact, in 677 at bats (Ichiro's present total), Sisler's BA would put him at 277 hits, well beyond our 2004 hit leader. If you've read this website before, you know that it's never that simple. If it were, it wouldn't be worth talking about. What if one were to suggest, say, that hits were easier to come by in Sisler's day? Immediately you reject the hypothesis, citing the Deadball Era in the way that people who don't know when the actual Deadball Era took place refer to any baseball played prior to 1990. But a quick Baseball-Reference scan reveals something you may find surprising: when Sisler reached 257 hits in 1920, the league-average BA was .295 - 28 points higher than it is now. So let's use some quick-and-dirty mathematics, for the sake of simplicity (there's that word again). Sisler's .407 batting average was 38% higher than the league-average .295 figure. Ichiro's .372 batting average is 39% higher than the league-average .267 figure. Sisler's overall offensive performance was very impressive, considerably moreso than Ichiro's 2004 line - Gorgeous George managed to slug .632 as he collected hits by the handful, putting up a .340 EqA to Ichiro's .319. He even managed to toss a perfect scoreless inning, one of 111 successful frames he pitched over his career. The 1920 version of George Sisler was a better offensive player than the 2004 Ichiro Suzuki is. Still, this isn't a discussion about value - it's a disscussion about hits. Ichiro appears likely to break Sisler's record 257, a feat that will bring all the steadfast purists out of the woodwork to protest a new achievement, just as they did Roger Maris' home run record when he surpassed Babe Ruth (also due in part to a longer season). However, given league context, Ichiro is racking up the hits at a slightly better rate than Sisler did. He deserves this record, asterisk-free. Willie Bloomquist has a higher IsoSLG than Ichiro!. Might want to save a screenshot of this bad boy. "They aren't unconventional, they just do things differently."